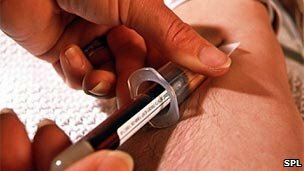 Experts believe a simple blood test could spot diabetes up to 10 years before the first symptoms of the disease occur. By looking at levels of five amino acids in the blood US researchers were able to correctly identify people who went on to develop type 2 diabetes. Ultimately the Harvard team hope a test like this could be used to screen for type 2 diabetes, Nature Medicine says. Early detection can help prevent related complications like blindness. Risk predictionDr Victoria King, head of research at Diabetes UK, said: “Early diagnosis and effective management of type 2 diabetes are crucial in reducing the risk of developing diabetes complications, such as heart disease, stroke, kidney failure, blindness and amputation. “Therefore finding ways to identify those who are at risk of developing the condition are important. The risk of developing type 2 diabetes is strongly linked to being overweight, leading a sedentary lifestyle and eating an unhealthy diet. In many cases the condition can be prevented or delayed by maintaining a healthy weight and lifestyle, Dr King said. Aside from keeping an eye on a person’s weight and blood sugar, doctors have had little else they can use to identify at risk individuals. The test used in the study looks for levels of small molecules in the blood. Among the 2,422 health volunteers tested, 201 later went on to develop diabetes. And the researchers found that the early blood tests readily identified these patients years before they developed any symptoms. Those with the highest levels of amino acids in their blood were five times as likely to develop diabetes within the following 12 years of the study. Dr Robert Gerszten and colleagues who carried out the work say more studies are needed before the test could be recommended for general use.